There is an intersection of two main roads on the south side of Americus, Georgia, this small town where the world’s affordable housing movement began and where The Fuller Center for Housing is headquartered. The streets at the intersection bear the names of two great Christian leaders — Martin Luther King Jr. and Millard Fuller. The Fuller Center’s simple offices are housed at 701 S. Martin Luther King Jr. Boulevard, about a mile from the intersection. It was 50 years ago today that we lost Dr. King to an assassin’s bullet in Memphis, Tennessee. Today, our address here on the highway named after a man who dedicated his life to righting injustices and empowering change through determined nonviolent activism is particularly significant. Dr. King knew that the Civil Rights Movement at its core was a grass-roots movement and was the first to credit the men and women of all races and backgrounds for making change possible. We, too, are building a better world by putting faith into action with grass-roots principles and dedicated supporters who give their time, money and passion to this ministry. These foot soldiers make change possible. As a wealthy white businessman hailing from Lanett, Alabama, at the time of Dr. King’s seminal “I Have a Dream” speech, Millard Fuller may have seemed an unlikely man to someday be honored with the Martin Luther King Jr. Humanitarian Award, an award that would be bestowed upon him by Georgia Gov. Zell Miller in 1992 at the State Capitol in Atlanta — the city where Dr. King’s body, but not his dream, was laid to rest. In the second half of the 1960s, though, Dr. King and Millard Fuller were pursuing the same dream — ending poverty. Millard and his wife Linda gave away their fortune to serve God. They did not know at the time exactly how they would serve God, but they would soon discover their path at Koinonia Farm, an intentional Christian farming community just south of Americus. It was at this racially integrated farm — a radical concept in these parts back then — that they would learn from theologian Clarence Jordan that “What the poor need isn’t charity, but capital; not case workers, but co-workers.” The Fullers saw the light. In 1968 — the same year Dr. King was assassinated — they launched Koinonia Partnership Housing and the Fund for Humanity. That was the origin of Habitat for Humanity and later The Fuller Center for Housing, the two affordable housing ministries founded by Millard and Linda. Dr. King, meanwhile, launched the Poor People’s Campaign in 1967, leading a new war on poverty. Both King and the Fullers worked tirelessly to lift families out of economic despair. They provided hope to individuals and communities. They inspired generations. At times, they grew frustrated and impatient while pursuing their dream. Yet, they knew that Jesus’ teaching in Matthew 26:11 that the poor would always be with us was not an excuse to quit trying to help them. In fact, it was one of Jesus’ most frequent counsels. Dr. King worked to lift the poor right up until the day an assassin’s bullet struck him down on April 4, 1968. Millard Fuller worked toward a similar dream right up until the day he died from an aortic aneurysm on February 3, 2009. 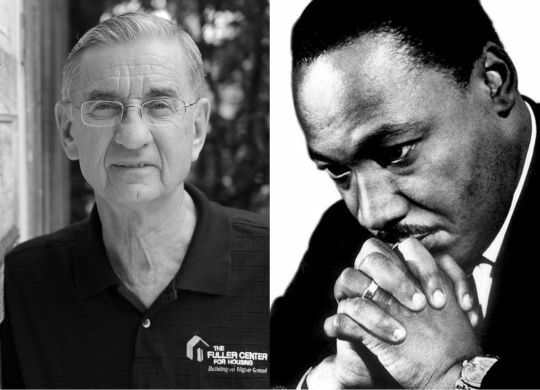 Had it not been for that bullet in Memphis, there is little doubt that the paths of these two great Christian leaders and tireless servants of God — one a Nobel Peace Prize recipient and one a Presidential Medal of Freedom recipient — would have crossed, likely often. We can only imagine what it would have been like to hear two of America’s greatest and most inspirational orators share a pulpit or a stage. They both could command an audience, and they both inspired generations to seek peaceful change and build a better world — especially for the poor among us. Their lives may have never intersected, but their dreams most certainly did. We see it every day through the efforts of everyone involved in this grass-roots ministry across this great country and around the world. The poor are still among us, and we are still called to help them. Should we ever need to be reminded, there are a couple of roads joined together here in Americus — the only place in the world where such named thoroughfares intersect — that offer us direction unlike any other.